Who Gets So Very Married on Super Bowl Sunday in Seattle? Well, Let’s Just Ask Brian and Shawna! 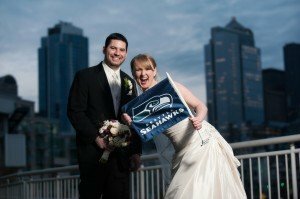 When Brian and Shawna started to plan their ’14 wedding last year, they didn’t take into consideration that February 2, 2014 was Super Bowl Sunday. And with great heart, intention and a fun-loving sense of humor, Brian and Shawna were married about 30 minutes after kick-off on Sunday afternoon, in the happy presence of 70+ family and friends (with only one cousin who couldn’t attend!). Shawna’s parents brought in a very large screen television. And after our sweet ceremony, family and friends gathered in the cocktail area (okay, Super Bowl Wedding area!) to find the Hawks up by 15 points. Can you say wedding gift?! And here is what I love: Brian and Shawna took all of this in stride and created and designed a wedding day that fully incorporated such a big regional and national event. Truly, one of my most memorable ceremonies and celebrations EVER! Comments Off on Who Gets So Very Married on Super Bowl Sunday in Seattle? Well, Let’s Just Ask Brian and Shawna!